Native Instruments (NI) have announced new versions of their groove production hardware Maschine and high-end controller Komplete Kontrol. Among the new features, the most notable is the new audio ins on the back of Maschine, finally allowing users to sample directly into the unit. There's also an audio out and headphone port so it's completely self contained. On top there's new bigger buttons and the high res five-inch colour screens from the flagship Studio version have made their way to Maschine mk3. There's also some new function buttons dotted around the unit and a new slimmer form. The software has had a redesigned GUI to match the slicker new unit and comes with 11GB Komplete Select library and 25 instruments and FX plugins including Massive, Monark and delay effect Replika. 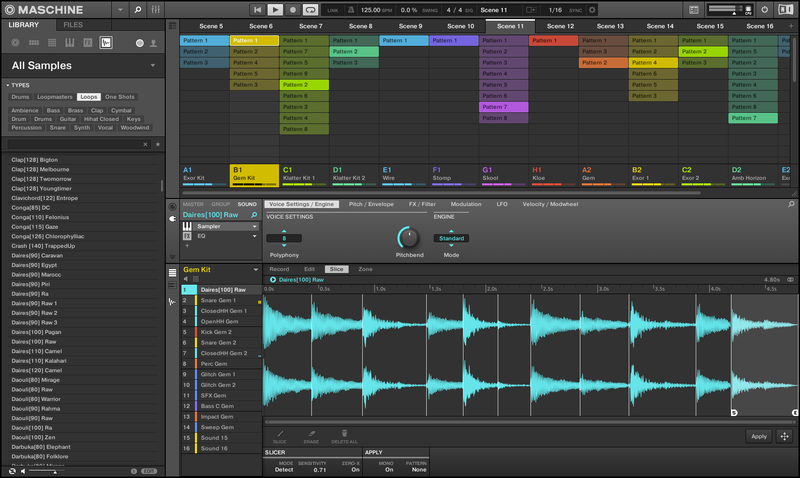 The highly-rated 8GB Maschine sample library is also included. NI also recently added a new bass synth. Best news of all? The price has remained the same at £479. Considering you get a sound card, two new screens and a whole lot of extra content for the same price, we can see Maschine mk3 being their biggest version yet. The new unit also remained USB powered or you can still power via included power supply. Komplete Kontrol has also had an update to a mk2 Studio verison, swapping the letterbox screens for much-welcome full colour ones, and re-introducing physical pitch and mod wheels, thought the touch strip remains below. There are 17 new functions on top and the renowned Fatar keybed has remained while NI have also added “enhanced DAW integration”. KKS mk2 as it’s now known costs £479 for the 49-key version and £559 for the 61-key version. If Maschine Jam is still the one for you, don't forget to vote for it in our Tech Awards.